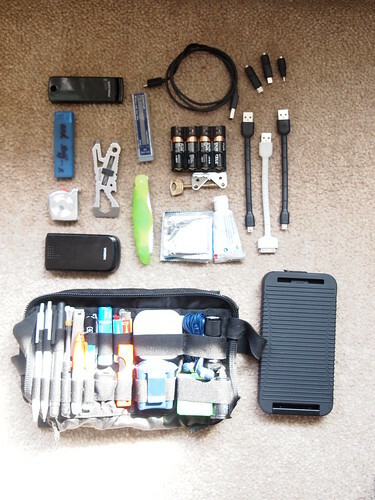 Following up from the 'What's in your pockets?' 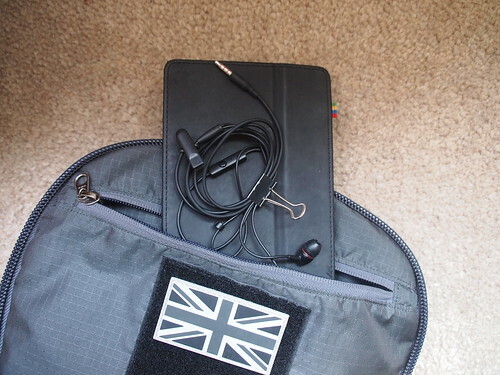 competition, thought I'd do a post of what's in my bag, even without the incentive of ITS goodies! 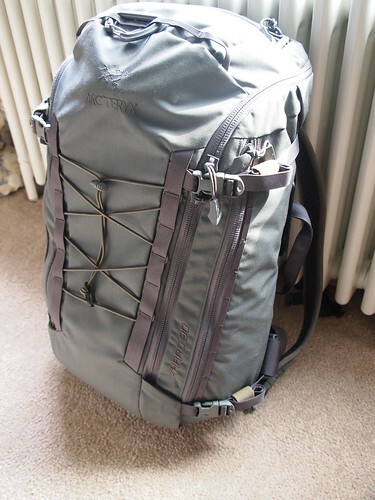 This is the bag, an Arc'teryx Khard 30 in wolf, perfect size to carry all I need and have room left over for whatever extras I'll need that day. I seem to have a different solution to most for the non-removable waist belt. I use some shock cord to keep it tidied away. On the left hand side is an ESSTAC KYWI Shotty Card, used instead for cables. Below that is a muji tarpaulin cube with various admin bits and bobs. 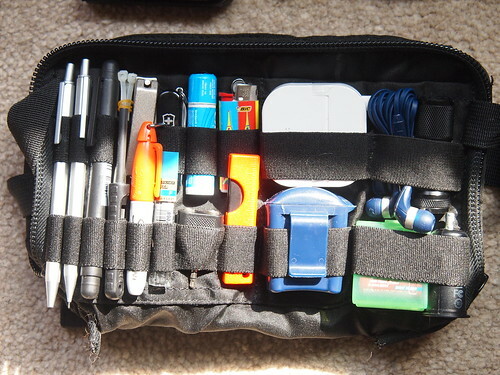 Attached to two grimlocs at the top is another admin pouch for speedy access. 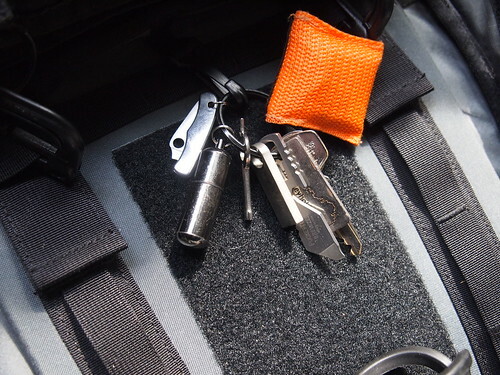 Below that is a keychain with various helpful tools and a CPR mask. Also stored loose is a TD Liberty Bottle and a Sea to Summit X-CUP, used more often as a dog bowl while on the move. 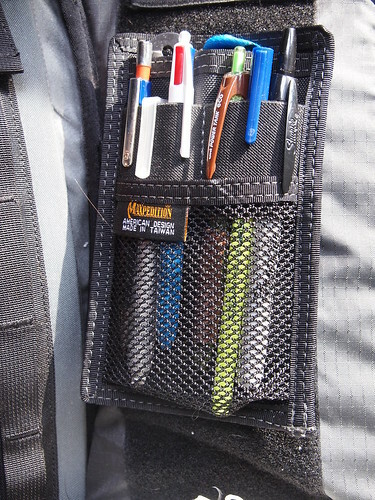 On the right, is a Maxpedition Hook and loop organiser, with pens, ID holder, Ruler, etc. 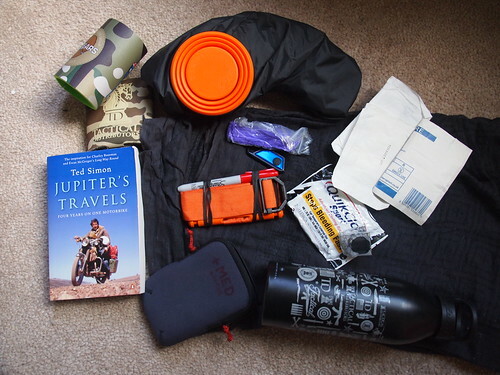 In the large zipped pouches on the side, are an Arc'teryx Beta AR and an Atom Vest. A Haglofs pack cover. Much as I love the khard, the top is very flat, so doesn't shed rain very easily. 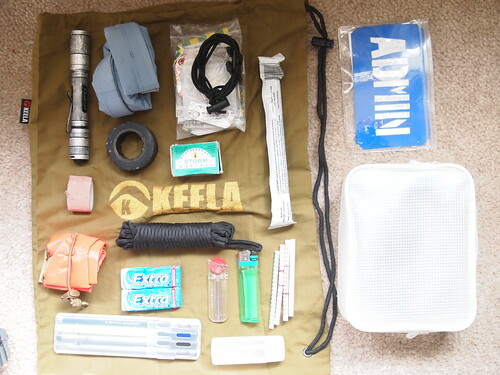 I hope this has given an idea of just how much can be fitted into the Khard quite comfortably. 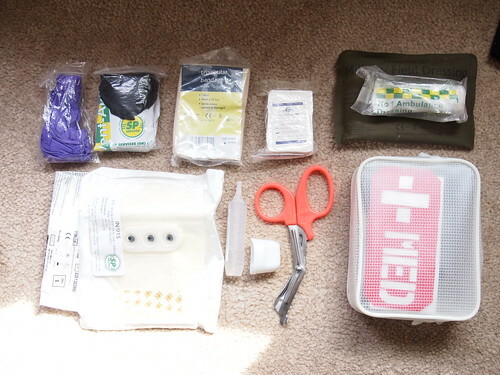 I welcome any suggestions on how I can improve my EDC, but for me it's not a survivalist thing, it's the equipment that makes my life go more smoothly and happily. Pretty pleased with this set up for now. If it looks like this is the max the bag can take, in addition to this yesterday, it carried another book, pants, socks and shirts for two days, a washbag, three coke cans, biscuits, a hat and had room to spare. It's a pack that's easy to pack well. I also love how it holds its rather handsome structure even when half full, rather than collapsing in an unattractive and uncomfortable manner. I haven't posted links to the products as there are just too many! But if you want any more info on a particular item, let me know below. 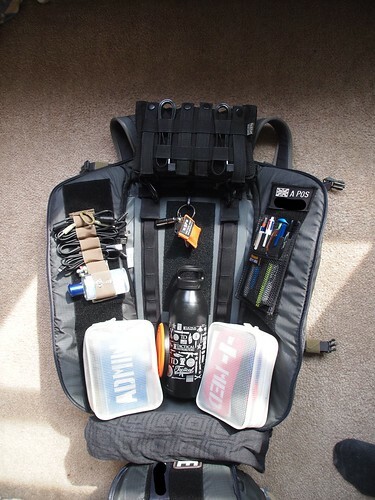 I welcome any suggestions on how I can improve my EDC, but for me it's not a survivalist thing, it's the equipment that makes my life go more smoothly and happily. Pretty pleased with this set up for now. To me, this is the true meaning of EDC. My actual EDC consists of my keys, phone, and wallet, when not working. I add or subtract things as needed. Good layout and organization, same goes for your post. Great post! I always learn something when I read a gear dump. 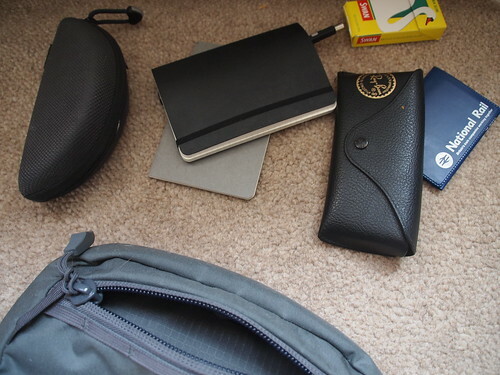 I like how organized you've kept things. If you search through the forums, we go through periodic bag talk binges. There was one a couple months back that actually started as a thread hijack. On that note, be aware... we are hijack prone here on ITS. Any thread other than the contest thread and the start here section seem to be open season for it. I think this is the best pack available (for me). If only they would be a little more realistic when it comes to pricing. I try tracking down used ones from time to time. Love the pics, great set up. Hijacks? 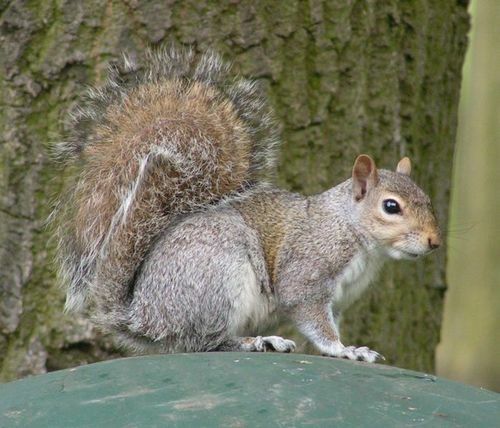 I have no idea what you're talking...Oh look a squirrel! Great bag drop! 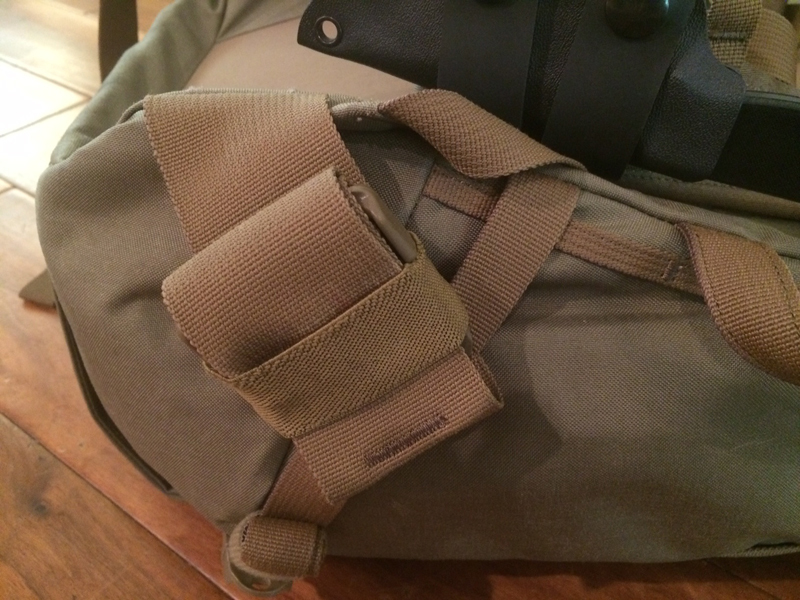 I have the same Khard 30 bag with some similarities. Will post mine soon.. Thanks, got a couple of ideas from yours. LOVE the idea of the shotty card as a cable minder! I'm stealing that trick. Edited by redsol1, 10 October 2014 - 07:45 PM. I like the compactness of those Monkey Tail USB cables. Slick looking kit ya have. Very organized! Thanks mlp2147. I haven't found the monkey tails to be the most robust cables. If I was buying now, I'd get the key style ones that have come out. I am really impress with the back pack... now considering to buy one unfolding like this one... I was hoping so much to see something like this one day! 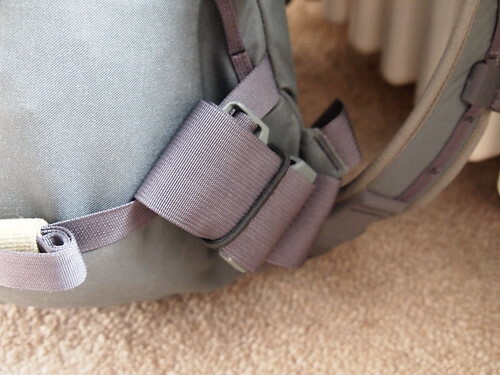 Is the shock cord hooking the belly strap just in a regular knot? Or do you have those synch plastic pieces. I would recommend using Riggersr bands. 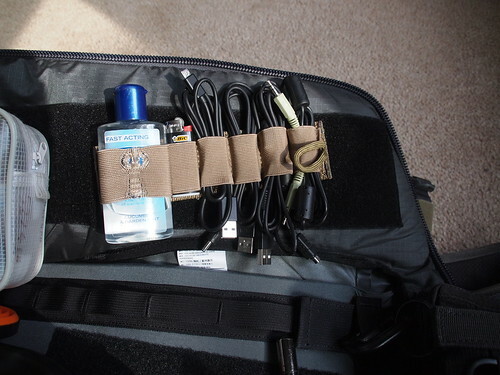 I have the same pack and store the waist straps the same way. Riggers Bands are the perfect size and can be purchased from the ITS Store 10 pcs for $1.99. 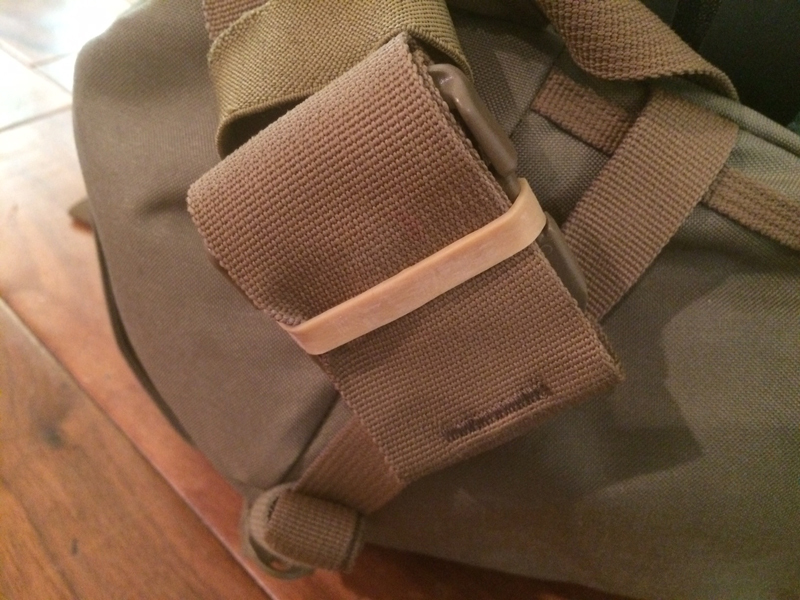 I then cover the Rigger Bands with the stock (inadequate) bands mostly for cosmetics. Edited by MarineFO, 07 March 2015 - 12:28 PM. Regular Knot. Cord lock is unneeded, as they're always the same size and I'm using shock cord instead of paracord. Riggers bands would do the job well too, though the shock cord slides on a bit easier.